Dec. 6, 2017 - Chevy recently partnered with John Deere at its world headquarters to show off its newest version of the HD Silverado pickup. The reason? A work-related backdrop is vital to understanding the needs of the HD truck owner and frankly what looks better than some spanking new construction equipment towed by shiny 2018 Chevy pickups? Chevy and John Deere partnered to show off the newest version of the HD Silverado pickup. The event highlighted a new trend in safety: driver assist features. 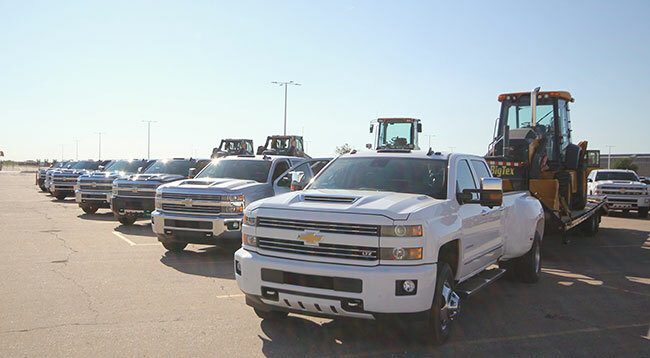 Chevy recently partnered with John Deere at its world headquarters to show off its newest version of the HD Silverado pickup. So, while this setup created the right visual, the actual towing of up to 20,000 pounds, it also highlighted not just power but a new trend in safety that has the OEMs tying existing on-board technologies together electronically. These are known as driver assist features. This is a new phrase that is becoming more common when describing the innovative electronic features found in today’s pickup trucks. I bring this up first when looking at the 2018 Chevy Silverado HD because the traditional newsworthy trifocal of towing, payload and power are fast becoming secondary to this new headline – driver assist features. I, for one, am just fine with that. Frankly, with the exception of a new hood scope design the tin on the 2018 has not changed and yet the truck has changed so much for the better. For 2018, the trend towards more electronic helpers continues, as does the quest for HD weight supremacy – after all that is still the name of this game. Looking at the growth of these numbers, just in the GM family, it backs up what I’m saying – drivers need help managing these loads. In 2011 Chevy’s max HD numbers were: payload 6,335 lb (3,009 kg); conventional towing 17, 000 lb (7,711 kg) and for fifth wheel towing 21,700 lb (9,843 kg) (up from 16,500 lb on the 2010). The next benchmark was 2015. Weight capabilities increased to a max payload of 7,374 lb (3,345 kg). Conventional towing climbed to 19,600 lb (8,890 kg). Fifth-wheel and gooseneck towing rose to 23,200 lb (10,523 kg). So, for 2018 this last set of numbers demands a truck that can handle them – power-wise and more importantly safety-wise. The new 6.6L V8 turbo-diesel has been redesigned with a new cylinder block and heads. Oil and coolant flow capacity has been increased and the turbocharging system is now electronically controlled. Horsepower has increased to 445 and torque now reaches 910 lb/ft. Ninety percent of both numbers are achieved at just 1,550 rpm. A new patent-pending feature is a redesigned air intake system. Using an integrated hood scoop (on 2018 HD Silverado and Sierra) this setup has a trap for snow, sleet and rain, allowing cool dry air to get to the engine without clogging up the intake. Chevy and John Deere partnered to show off the newest version of the HD Silverado pickup. The event highlighted a new trend in safety: driver assist features. A new two-piece oil pan makes the Duramax quieter and also houses an integrated oil cooler with 50 per cent greater capacity than found on the current engine. Of particular interest to Canadians will be the new Duramax cold-weather performance. With microprocessor-controlled glow plugs the engine requires less than three seconds to preheat in temps as low as -29 C. These new ceramic glow plugs adjust current to each plug based on outside temperature. This new engine continues to be coupled to the Alison 1,000 six-speed automatic transmission, which has a stellar reputation. This mechanical update to this Duramax diesel engine now officially starts it building sales into its second generation. The original Duramax sold over two million copies since its 2001 introduction. So that covers power, but moving loads safely requires all the trucks systems to work together “smartly.” GM’s HD trucks get a number of system upgrades this year to build on the trend it started in 2015. A new Digital Steering Assist improves road handling. A new tire pressure monitor system now includes a tire fill alert. All full driver alert package includes lane departure warning, forward collision alert, safety alert seat and front and rear park assist. GM’s longtime StabiliTrak stability control system has been updated to include rollover mitigation technology, a tie-in to the trailer sway control and hill start assist. Visual help is found in the Chevrolet MyLink with an eight-inch diagonal touchscreen. Of particular interest is the camera system that broadcasts on this centre-mounted touchscreen (now standard on all models with cargo box). It shows reversing images that make hooking up easy – whether it’s to the bumper hitch of the in bed fifth wheel. An around-the-truck view assists in parking maneuvers. While driving the signals now activate cameras in the mirrors showing images down the side of the truck, highlighting the blindspot. I also noted that you can right down the side of any towed trailer as well. Other improvements include an available gooseneck/fifth wheel trailering prep package that will include a spray-in bedliner. Electronic upgrades include wireless phone charging and remote locking tailgate. These are the types of driver assist systems that I see coming into the mainstream. These will help prevent collisions and in general make the operators job that much easier and that is the future. The OEM’s have built a generation of highly competent HD trucks – load wise – now they have to help make them easier to drive and safer in general. From what I saw in Iowa, GM is well on its way to this goal.